Check out the various Dallas events going on this week! Alamo Drafthouse: One of my favorite monthly events that the Drafthouse, the AGFA secret screening, is happening tonight at 8:00 pm. As always, we never know what it will be, and best of all, it's only $5 to reserve a ticket. Texas Theatre: Tuesday Night Trash (TNT), the free movie series at the Texas Theatre returns with a little shoutout to the GUARDIANS OF THE GALAXY director James Gunn with TROMEO AND JULIET, who wrote this interesting little movie. As always, it's free and it starts at 9:15 pm. For the remainder of the week, the Theatre will be screening their awesome 35mm print of GUARDIANS OF THE GALAXY. Click here for showtimes. Angelika Dallas: Unless you're some type of turbo-nerd, the new DRAGON BALL Z: BATTLE OF THE GODS movie came out of nowhere. The story deals with Son Goku and his bros having to fight yet another super powerful being out in the desert somewhere.. this one will screen at 7:00 pm. And for the non-9 to 5 crowd, there is an 11:00 am of the Oscar-nominated ERNEST & CELESTINE, which is a gorgeous hand-drawn movie about the unlikely friendship between a bear and a mouse. Kessler Theater: Pick of the Week! 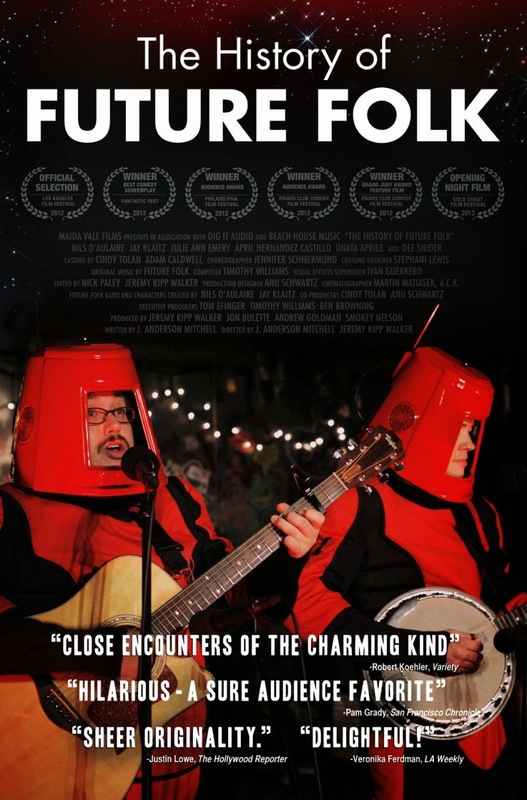 Do214.com and the Kessler Theater will be presenting both a free screening and a concert with the best folk bluegrass duo from outer space, Future Folk! Their movie HISTORY OF FUTURE FOLK is one of our favorites. I reviewed it back in 2012 when it came to Fantastic Fest and a year later, and Jonesy reviewed it as well. Following the screening, there will be a live performance by the band. Admission is free but you do have to RSVP over at Do214. Doors open at 7:00 pm, movie screens at 8:30 pm and the guys will perform at 10 pm. Alamo Drafthouse: Legendary comedy troupe, Monty Python is performing on stage in London's O2 Theater after many years apart and to celebrate, they will be broadcasting the performance in theaters around the world, the first showing is sold out but the 7:30 pm and the 8:25 pm showings are still available. Alamo Drafthouse: If the new TMNT reboot is not up your alley tonight, why not check out the James Bond classic LIVE AND LET DIE, which is part of the ongoing Bondthology series, at 7:00pm. Angelika Dallas: This week's After-Hours will be the classic Edgar Wright action movie spoof (?) HOT FUZZ. It screens at 11:30 pm. Alamo Drafthouse: Director Brad Bird's animated classic, THE IRON GIANT will screen at 8:00 pm and tug at your heartstrings. For those that have yet to see it, this is a must. Granada Theater: As I mentioned when this series started, I am not a fan of this "Mockbusters" way of watching a movie. There's something about Dallas audiences that's already frustrating when watching older movies where they ignorantly mock older movies that are good but just happen to have dated special effects or dialogue. I'm of the belief that setting up screenings just to make fun of them on Twitter, without say Master Pancake, encourages that bad behavior. Regardless, I love the Granada, so here's the info: They'll be screening the Michael Bay disaster opus, ARMAGEDDON at 7:00 pm. Admission is free but you'll want to get there early. Once there, you can tweet at @granadatheater and your hilarious tweets and commentary will show up on the big screen. Alamo Drafthouse: As part of the Assemble The Team! motif for August, there will be a special screening of THE WILD BUNCH at 12:30 pm. The Sam Peckinpah classic is a must see on the big screen and one of the best westerns out there. For funsies, you can do a double feature of this and NO COUNTRY FOR OLD MEN and you'll be able to see some thematic parallels about old age and escalating violence.